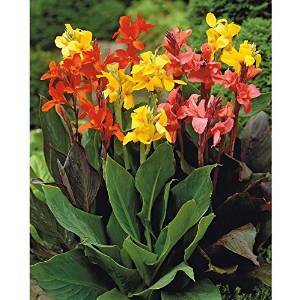 Canna Mix - Tuber Canna Rewarding, Richly Flowering Plant Canna's also known as Indian Shot is an eye-catching plant that flowers in summer and early autumn. The intensely coloured flowers are excellent garden subjects and bring a tropical ambience to patios and decking. These medium-tall, free-flowering varieties can be planted in a spacious pot or straight into the ground. The beautiful blend of yellow and red Cannas looks fantastic in a large planter or window-box. Use pots with holes in the base with a layer of gravel or clay pebbles. Put some potting compost in the pot and plant the Cannas at the right depth. Fill the pot with potting compost and press firmly. Water the Cannas immediately after planting and stand the pot or window-box in a sunny spot. The warm colours coupled with the green leaves of this Canna mix have an enchanting, exotic look, therefore indispensable in a border that is 'tropical' in nature. You can create extraordinary combinations with the Tritoma Grandiflora (kniphofia uvaria 'Grandiflora'), palm lily (Yuca filamentosa) and montbretia (Crocosmia x crocosmiiflora). Provide a sunny spot, so that these tropical plants feel at home.